On Saturday, Sea Shepherd founder Paul Watson was talking to The Associated Press by telephone from his ship when he said the whalers suddenly began blasting one of his group's inflatable boats with a water cannon. "They just turned their cannons on our Zodiac," Watson told The AP. "Right at this moment." The Japanese are allowed to harvest a quota of whales under a ruling by the International Whaling Commission, as long as the mammals are caught for research and not commercial purposes. Whale meat not used for study is sold for consumption in Japan, which critics say is the real reason for the hunts. Each hunting season runs from about December through February. The Sea Shepherd Conservation Society's vessels have been seeking to disrupt the Japanese whalers on their annual hunt in Antarctic waters since mid-December but had not been able to sight the Japanese fleet until Friday. The society's president Paul Watson said that now they had made contact with the whalers, they would attempt to prevent any of the whales from being slaughtered. "It's got its water cannons turned onto us right now so we're manoeuvring through ice and trying to outmanoeuvre them so it's a little dicey," Watson told ABC Radio. 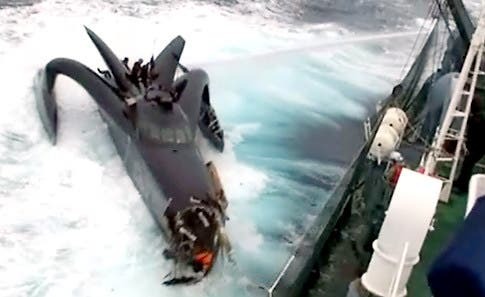 Locky MacLean, the captain of the Sea Shepherd's 'Gojira' vessel, said the society's three boats had been "dancing dangerously through the ice packs locked in confrontation with the three harpoon ships". "It was both deadly and beautiful," he said in a statement on the society's website. "Deadly because of the ice and the hostility of the whalers and beautiful because of the ice, and the fact that these three killer ships are not killing whales while clashing with us." 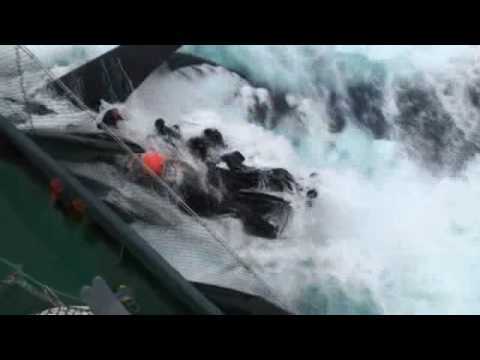 The activists said the clashes involved several high speed chases and near collisions among jagged ice floes, and alleged that the whalers turned water cannons and hoses on their crew. "Sea Shepherd responded with some rather unpleasant foul-smelling substances," they said in a statement, adding that there were no injuries. A Sea Shepherd spokesman was unable to confirm what was thrown, but in previous years the activists have tossed rancid butter, or butyric acid, stink bombs at the whalers to make their decks unusable for slaughtering whales. The conservationists said now they had found the Japanese fleet, 1,700 nautical miles southeast of New Zealand, they would continue to harass them to prevent them from killing whales during the southern hemisphere summer. "Our objective is to save the maximum number of whales and to maximise the financial losses of the whalers at the same time," Watson said in the statement. Australia has taken legal action against Japan to prevent it from hunting whales by exploiting a loophole in a 1986 global moratorium which allows whaling for research purposes.